In Third Age of Middle-earth, Thorin Oakenshield and his Company of Dwarves came upon a troll. There Thorin found an ancient Elven sword named Orcrist, forged by the high Elves of the West, in Gondolin. Thorin claimed Orcrist for his own and vowed to cleave Goblins with it once again. He wielded the sword through most of the Quest for Erebor, using it against the Goblins of the Misty Mountains. The Goblins called it Biter and hated and feared it. The blade of Orcrist features a curved leaf shape on one side, and a straight edge on the other, a fitting design for a blade meant to cleave Orcs and Goblins. Adorning the pommel is an emblem of the heraldry of Ecthelion of the Fountain. The hilt is shaped from the tooth of a dragon. It is unknown if the tooth was acquired prior to the fifth battle of the First Age, or added to the sword with the inscription in the millennia after the Fall of Gondolin, most likely by the Dwarves of the North. Inscribed on the blade in elven runes are numerous phrases, which read as follows. On the guard is the name Orcrist, which means Goblin cleaver. Inscribed on the blade, on both sides are the runes that mean the serpents tooth. This authentically detailed replica is a reproduction of the actual filming prop built by Weta Workshop of New Zealand and used in the motion picture, The Hobbit An Unexpected Journey. This replica has been painstakingly and meticulously recreated using only the finest grade materials and top quality craftsmanship to ensure that this movie replica looks like it has come to you directly from the silver screen. 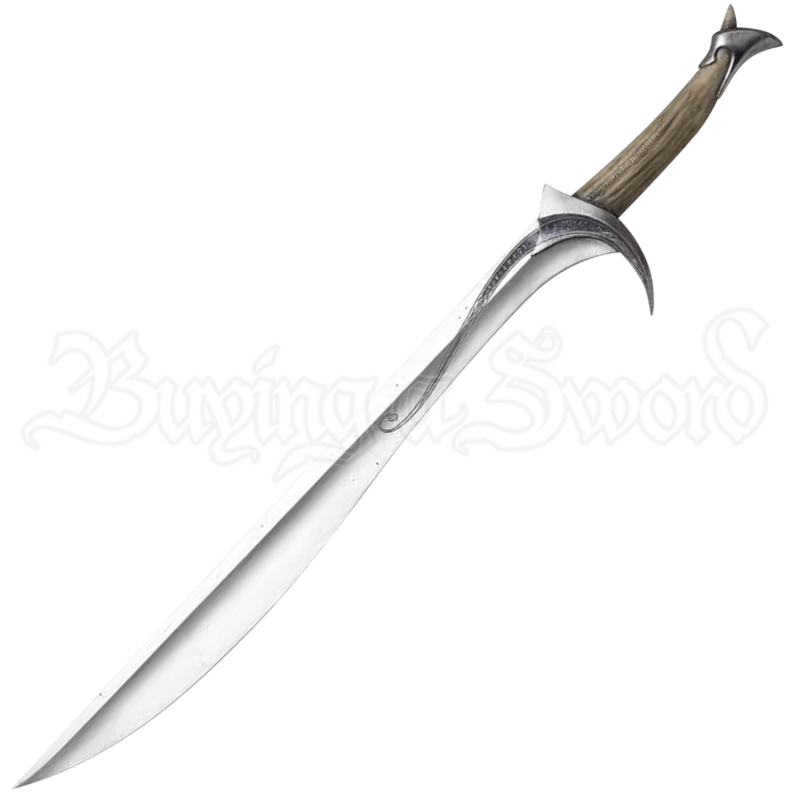 The sword measures approximately 38.75 inches long. It features a stainless steel blade with etched, runic inscriptions. The guard is crafted from cast metal and features simulated gemstones, while the hilt features an acrylic resin grip that is modeled on the original prop. Close attention to detail was a top priority during its construction, ensuring the utmost detail possible on each piece. It is presented with a wood wall display and also includes a certificate of authenticity.